There are only a hand full of artists whose eloquence and finesse would require a review greater in length than the entire collective works of Shakespeare. 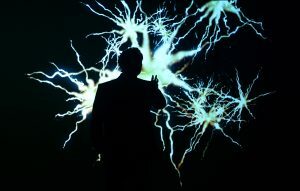 Robert Lepage is one such artist whose work deserves a great tome of a review, in one sentence, Lepage is the kind of international artist Britain needs to shake up contemporary theatre right now. On stage at the Barbican, Lepage unpacks a meaty 2 hour autobiographical performance-come-lecture that explores the capacity of memory, identity and the loss of childhood innocence. Lepage, known for his intelligent use of visual and multimedia effects, does not disappoint in this solo performance in collaboration with Ex Machina. His story unfolds as we see him unable to retain the words of a poem for a recital, from there Lepage begins an investigation into the very act of remembering. Against the backdrop of the working class streets of Quebec in the 70s, Lepage take us on a child’s eye journey of political unrest, identity and family bereavement. This show does not lose focus, impressive for an 120 minute one hander with no interval, showing the strength of its dramaturgy from Peder Bjurman. Dramaturgs are few and far between here in the UK but its a vital role that European theatre makers have been relying on for years. British theatre can frequently fall flat on its face at the word ‘collaboration’. Directors take precedence over lighting designers, costumiers and set designers in more traditional theatre dynamics. Over the pond and across Europe these power structures have shifted, allowing dramaturgs, director and actors to create work that has a more ‘holistic’ approach to it’s development and delivery. Lepage offers us Brits a glimpse into how dynamic a performance can be when great creative minds collaborate together. Lepage’s set design is a force of its own, as the stage becomes a giant dolls house we see the life of the artist unfold in miniature. The walls of the set seemingly unfurl like an intricate origami sculpture, this sense of play drives the piece from its most comic moments of Lepage re-enacting conversations with a long lost friend to its bleakest, coming face to face with the ever present enemy. This is a solo show on steroids, but make no mistake Lepage offers us time to breathe and take stock. His versatility as a performer, director and writer far outshines any solo autobiographic performance you can see in the UK. Excitingly, Lepage’s creative troupe Ex Machina have just finished touring their 2013 piece (The Far Side of the Moon) to regional areas across the UK, so hopefully more of his visionary work will be seen in areas that get little international attention. Review written by Niall Hunt.